GlobalMed Technologies (GMT) announced today that it has acquired Omnilux Medical, the gold standard for medical and aesthetic Light Emitting Diode (LED) skincare. The asset acquisition includes three Omnilux Medical Systems: the Omnilux Revive2™, Omnilux Blue™ and Omnilux Plus™, along with numerous patents and trademarks. “Recognized worldwide as a leader in light therapy, we were thrilled when we had the chance to acquire Omnilux Medical devices and add the U.S. market to our portfolio,” said Sanders Ergas, President of GlobalMed Technologies. Omnilux Medical was formerly a professional device line of PhotoMedex, Inc., a global skin health company based in Horsham, Pa. that provides medical and aesthetic solutions to dermatologists, professional aestheticians and consumers. With the closing of the deal, GMT acquires access to an installed base of more than 3,000 Omnilux systems worldwide. Omnilux LED platform technology relies on the principle of photobiomodulation whereby cells absorb light to stimulate cellular function, leading to beneficial clinical effects. 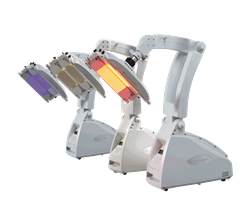 The treatment head of each Omnilux system emits light at specific, narrowband wavelengths to create a biochemical reaction of target skin cells. Depending on the matrix of LEDs, which provide different visible colors of light, Omnilux noninvasively treats a wide range of dermatologic conditions, including acne, wrinkles, pain management and non-melanoma skin cancer, among others. There are over 30 peer-reviewed clinical studies published in highly regarded professional journals that validate Omnilux safety and efficacy. Based in the San Francisco Bay area, GlobalMed Technologies is the one-stop sales and marketing solution for medical device manufacturers wishing to enter or increase sales in the international marketplace. Formed in 1996, the company has represented some of the industry’s most visible and innovative brands in medical and aesthetic dermatology. GMT operates in over 60 countries throughout Europe, the Middle East, Asia Pacific, and the Americas. For more information, please visit http://www.globalmedtechnologies.net.